Platinum Protection Group is uniquely qualified to provide you with a security solution customized to meet your specific needs. Their team consists of current and former police officers who offer years of public safety experience and specialize in personal protection while maintaining the highest standards of professionalism of any security agency. Eagle Aerial specializes in custom aerial photography throughout Southern California. They use both fixed wing and helicopter to take oblique and vertical photos. Eagle is also a premier developer of orthorectified aerial photo maps for GIS applications. Offering complete video services including film transfers, photo montages, video duplication, linear editing & MPEG-1 encoding. Putting your company's logo onto an existing promotional tool or newly created product specifically designed for your company. Helping you personalize your promotional items to a specific person, business, organization, event or any company of your choosing. Advertise your event on OrangeCounty.net, SanJuanCapistrano.net or theBeachCities.com for maximum exposure. Also offering web design, programming, corporate identity, video and commercials. George Dans is one of North America's leading authorities on the development of human potential, personal and professional effectiveness and business leadership. His approach is dynamic, exciting and interactive. He specializes in training individuals in auto sales training, sales management, leadership, and helping sales staff reach their true potential. Reach a Broader Audience with Live Interactive Video Streaming! Gain more exposure for your next event by using our online video streaming services. 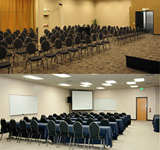 The Business Expo Center in Anaheim has a live video streaming system that allows you to broadcast your business meeting conference or trade show to anyone with an internet connection on devices such as computers, tablets, and smart phones. To see how you can use our facility to create a memorable event, contact us today at (714) 978-9000.